The 1852 quarter is a scarce coin in any grade. Though it becomes more difficult to find with increasing grade, it is actually a bit more available than many early P-mints in mint state and less available in circulated condition. This is presumably because the issue had little time to circulate prior to the weight change of 1853 at which time most were either hoarded or melted. The 1852 Philadelphia issue also features a quite rare and interesting die variety, the 1852/52 repunched date. The 1852/52 (Briggs 1-A) is a particularly desirable variety for a number of reasons: 1) it is rare, 2) the repunching is obvious, 3) the date position is unique so that attribution is clear even for low grade coins, and 4) the only two known proofs were struck from the same dies as the 1852/52 business strike coins. 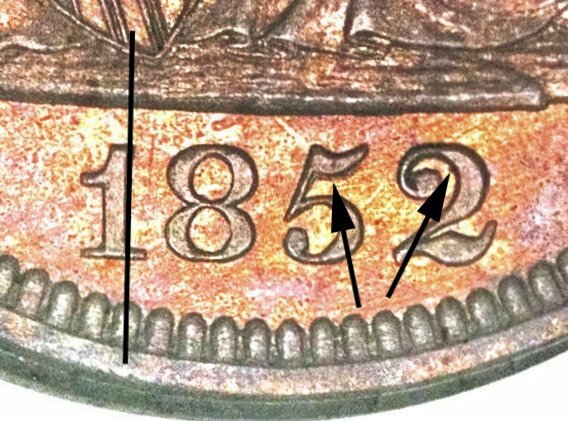 In addition to the obviously repunched numerals, attribution of the 1852/52 is determined by noting that the right side of the one lines up with shield lines 6/7 as opposed to the only other obverse die which has a date further to the left (right side of 1 lines up with shield line 5). Though one of only two known die pairs, the 1852/52 represents only about 10% to 15% of all 1852 quarters. The 1852/52 accounted for 2 of 21 examples reported in the 1993 LSCC survey and 10 of 46 examples in the 2007 survey. A study of 40 recent sales of 1852 quarters in the Heritage Auction archive revealed six examples (including the proof coin sold as part of the Kaufman set in 2008 - Heritage ANA 8/2008:1823 at $138,000, ex. Pittman). There are also two known examples of the 1852/52 quarter with significant die rotation. One specimen, discovered prior to publication of The Comprehensive Encyclopedia of United States Liberty Seated Quarters (1991), has a 90 degree rotation. Another example discovered more recently has a rotation of about 45 degrees.